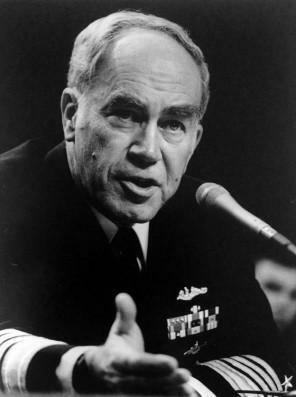 Admiral Kelso directed the Navy’s military actions in the Persian Gulf War. WASHINGTON — Frank Kelso, a retired Navy admiral whose tenure as chief of naval operations was clouded by the Tailhook sexual harassment scandal, which focused a glaring spotlight on a rowdy military culture of aggressive male behavior toward women, died Sunday at a hospital in Norfolk, Va. He was 79. The cause was complications of injuries from a fall, said his son Tom. Admiral Kelso had lived in Fayetteville, Tenn.
During almost 38 years as a career Navy officer, Admiral Kelso served aboard nuclear submarines, commanded the Atlantic Fleet, and directed the Navy’s military actions in the Persian Gulf War. In 1990, he was named chief of naval operations and supervised the largest reduction in naval forces since the end of World War II. But much of his career was overshadowed by the events of Sept. 5-7, 1991, at a convention of the Tailhook Association in Las Vegas. Admiral Kelso was one of about 4,000 to attend the event for naval aviators. Within months, word began to leak out of a raucous gathering in which male officers repeatedly groped and fondled women, many of whom were fellow military officers. The Tailhook events exposed a Navy culture in which men, often fueled by alcohol, felt free to treat women as sexual objects without fear of reprisal. Admiral Kelso ordered an investigation and was dismayed when he learned that one female officer had sought help from a senior officer three times, only to be ignored. Witnesses claimed to have seen Admiral Kelso near where harassment occurred. Admiral Kelso maintained that he saw no misconduct and had done nothing wrong. No one faced a court-martial over Tailhook, but several admirals and other top officers were forced out of the Navy or otherwise disciplined. He was allowed to retire at his full four-star rank.